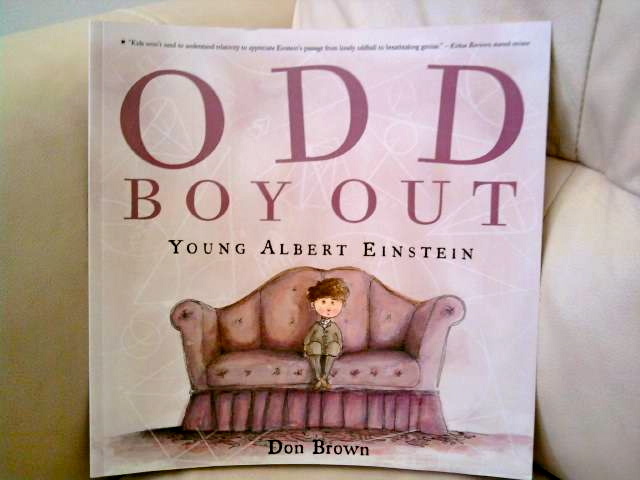 GatheringBooks is proud to cast the spotlight on Don Brown’s picture book, Odd Boy Out, for Nonfiction Monday. Nonfiction Monday is hosted this week by Tales from the Rushmore Kid. I fished out this beautiful picture book while meticulously browsing through Barnes & Noble’s biography shelf located in a small corner of their children’s literature section. I found it rather disappointing that the store did not carry a wide selection of “eye-catching” biography books for children. Most of the books in the shelf were flat-out, straightforward biography books that either have “Who is…?” or the actual person’s name in the title. 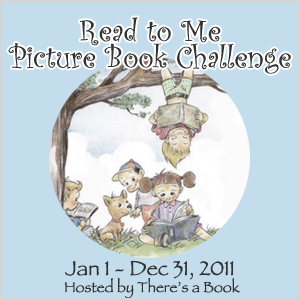 Much to my relief, I found 5 or 6 biography picture books that have interesting titles and beautiful illustrations. I allowed myself to buy 2 that day, and Don Brown’s Odd Boy Out was one of them. As with most biographies, Don Brown begins his adaptation with the birth of Albert Einstein. Overlooking Ulm River. Click here to be taken to the web source. While most parents and grandparents rejoice at the birth of the firstborn in the family, the reactions of Albert’s mother and grandmother fell outside the norm. Mommy Einstein thought Albert’s head was too big. Granny Einstein, on the other hand, said Albert was “much too fat.” There was barely room for rejoicing. Literally baby Einstein. The earliest photo of our young genius. Click the image to be taken to the web source. Don Brown presents the readers with both good and bad traits – if you could even describe those as such – of young Albert without trivializing or glorifying our born-to-be genius. Although it took a while for his family to hear him talk, Albert had already manifested giftedness at a young age (a topic much-loved by Myra). Albert Einstein, aged 14, with sister Maja. Click on the image to be taken to the web source. In spite of his giftedness – which was often times looked upon as an oddity – Albert was to remain detached from the world throughout his growing years. 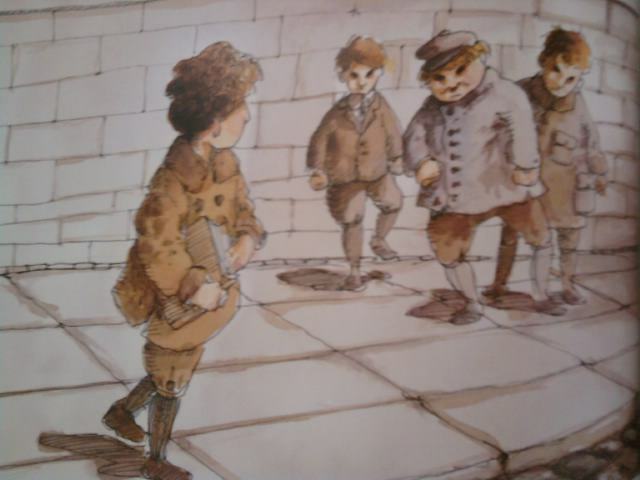 Don Brown proceeds with young Albert’s story by portraying his temperament. At times he was cruel to his sister Maja and he would throw tantrums to the hired tutor. Only a boy such as Albert can teach us, effortlessly, a thing or two about individuality. Unlike most kids, he did not like sports nor did he find soldiers on parade exciting. He enjoyed spending time alone, getting lost in the city, building houses of cards, and even something as simple as looking at a compass! 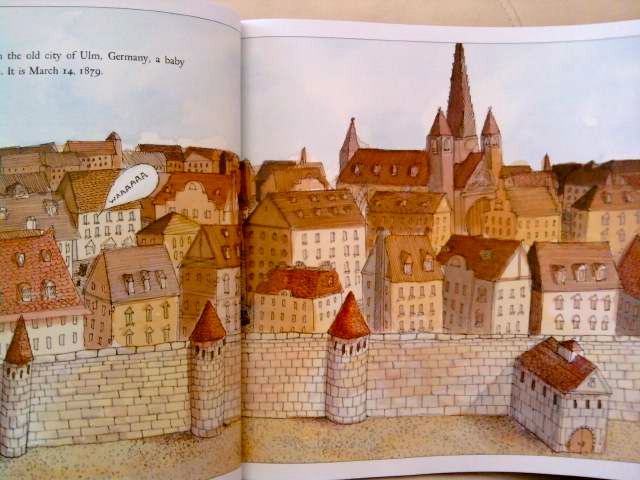 The large city of Munich where Albert’s parents “encourage his independence and take the unusual step of allowing four-year-old Albert to wander the streets unattended.” Click on the image to be taken to the web source. Young Albert and the German schoolboys who teased and taunted him. But Albert is Albert. He was not one to be disheartened or deterred. Albert simply brushed off the insults and, instead, immersed himself in music and math. He particularly enjoyed playing the violin, and it was through his friend Max Talmud that his profound love for mathematics developed. Albert Einstein and his violin. A bit of trivia: There is a novel called The Case of Einstein’s Violin by William Sullivan. Inspired by our celebrated genius? Perhaps. Click on the image to be taken to the web source. Max Talmud (later known as “Talmey”), Albert’s closest friend. Click on the image to be taken to the web source. Click on the image to be taken to the web source. When I saw Myra’s comment last night on my recent IMM post, I realized that it would be a little treat to briefly touch on the topic of giftedness. After all, we are talking about the life of a gifted child here. I decided to juxtapose young Albert’s life with the following misconceptions about giftedness that I found here and here. Gifted kids are high achievers who do really well at exams. Young Albert does well in subjects that he likes and ignores the rest. Years later, when he enrolls in Zurich Polytechnic in Switzerland, he fails the entrance test because he is unprepared in the subjects that he neglected when he was younger. Children who do badly in school and fail exams cannot be gifted. This is related to the previous misconception. As young Albert had mentioned, school works are mechanical and repetitive. Gifted children are abstract thinkers. The former and the latter are opposite ends of the pole. Gifted kids are always top of the class and are “teachers’ pets”; their gift is highly prized by their school and as such is rewarded. It was never mentioned that young Albert was at the top of the class, and his teachers’ treatment of him certainly does not exhibit his being a teacher’s pet. His school does not recognize his giftedness because they rely heavily upon class performance and participation. In addition, giftedness is not limited to doing well in academics. One can be gifted in the arts, in music, in sports, among others. It is always a pleasure to read about famous people living their ordinary lives extraordinarily – if that even made sense to you. Another thing worth mentioning is how, throughout the book, Don Brown addresses Albert Einstein with his first name, making it seem like he was just one of the fellas in your neighborhood. 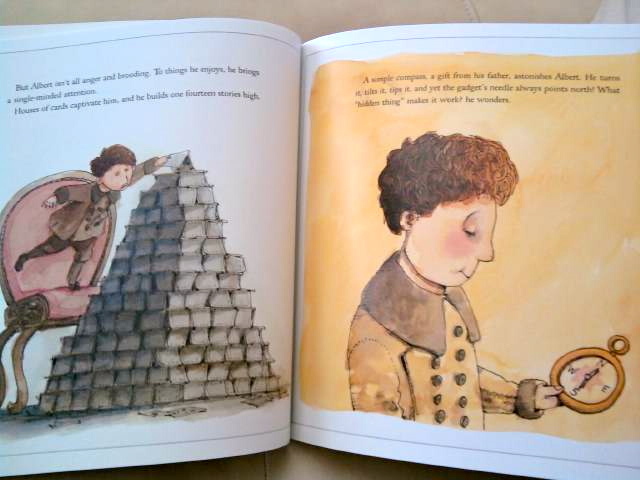 Lastly, while most biographies lightly touch on a person’s childhood, Don Brown’s adaptation – complemented by his pen and ink, and watercolor illustrations – is a celebration of the young mind: fresh, honest, and brilliant. A famous portrait of Albert Einstein taken during his birthday. Click on the image to be taken to the web source. Albert Einstein is also famous for his crazy hair. Click on the image to be taken to the web source. Albert Einstein, in shining glory. Click on the image to be taken to the web source. For famous quotes by Albert Einstein, click here. Author-Illustrator Don Brown. Click on the image to be taken to the web source. Wow, Fats, a really outstanding book review. I love how you have interspersed comments on the biography with additional information on Einstein. I have been up that big tower in ULM, it offers some great views of the city and beyond. It was indeed so very appropriate to add some of the misconceptions about giftedness. Paradoxically their school experience is often painful and unremarkable or even very mediocre in performance. Many schools do not have the resources to cater to their special needs. Hello Joanna! Thank you for the kind words. I love to quote essential parts of the books to highlight significant points in the review. It’s the book’s way of making its point. I would like to visit Germany sometime. I met this German boy through a social networking site, and he said that if I ever do plan to visit, he could show me around! You made a good point on the school experience of gifted children. Indeed, there are not enough resources to cater to their needs. Also, teachers are often at a loss on how to deal with them, hence they lack the guidance and support they need to hone their gifts. You have found a goldmine with Don Brown – I didn’t know about him until after you have done this review. I checked our community library. Apparently he has also written something about Thomas Alva Edison, the young Jim Thorpe, the Titanic’s sinking and a few more. I now have more books to borrow from our library. Looks like he provides an amazing amazing resource. I know how very sick you are, dearest. And this review is beautifully written despite your illness. Such dedication indeed! I send you more healing energies and my hugs across the miles. Lovelovelove. I didn’t know about him, either, until I found this tucked in the corner of the shelf. Don Brown’s illustrations – the light texture of his pen, ink, and watercolor art – are so appealing to the eyes that makes Albert Einstein so adorable as a child, in spite of his temperament. The back of the book contains a listing of other books by Don Brown. I believe I’ve seen 2 more at Barnes & Noble. I would definitely grab a copy of those! Yes, he does provide a truly amazing resource. This looks like a great book about one of my favorite people. Great Review and accompanying pictures. I also like the additon of misconceptions of giftedness, which are only too true. Thanks for the great review and additional info and photos. I’m a big fan of well written PB biographies. Will have to look for this one :). This is an excellent review! I haven’t read a picture book treatment of Einstein as a young boy. Has anyone had a better year than Einstein did in 1905? He literally changed the world with his papers published that year. Yup, I second or third the appreciation for including information about the struggle gifted students can have in the classroom. I’ll keep this recommendation in mind when a student-teacher comes looking for a picture books about ‘giftedness’. Excellent review. I love the illustrations in the book. What a great and thorough review. I really love the look of the art work in this book. Thanks for bringing this book to my attention!